Khorosho Productions: Lila of the Resistance Released and a SALE! Lila of the Resistance Released and a SALE! 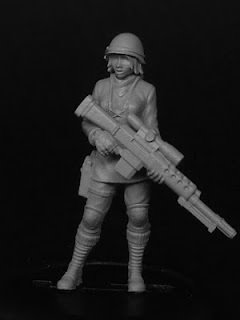 Statuesque Miniatures is pleased to announce the release of Lila of the Resistance, sniper and weapons specialist! Measuring approximately 32mm unposed, Lila joins our growing Resistance Fighter range, all featuring interchangeable heads for more variety. Lila can be armed with either a sniper rifle or an S.O.E.-supplied Experimental Energy Cannon. Lila of the Resistance is priced at £4.75. Purchase two Lila for £4.50 each ; three or more for £4.25 each. 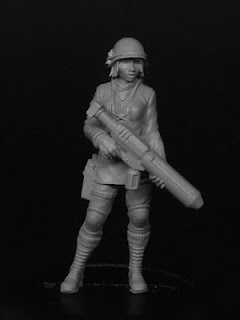 Also starting now, Statuesque Miniatures is running a Sale with 10% OFF all figures, excluding accessories. Use the code LILA2012 to get your discount! This discount is in addition to the quantity discounts we offer across our range. The sale runs until 16th December 2012.